Long gone are the days of “over the river and through the woods” by a horse driven sleigh. Nowadays, people are heading to grandmother’s house by plane, bus, train, motorcycle, and automobile; congesting roadways and increasing the risk of vehicle accidents during the holiday season. Regardless of whichever way you choose to travel, it’s important to make safety your number one priority so that you may arrive alive during the holidays! Whether you are driving the family to the country for the holiday weekend or you are a passenger in a car, you are required by law to buckle up. 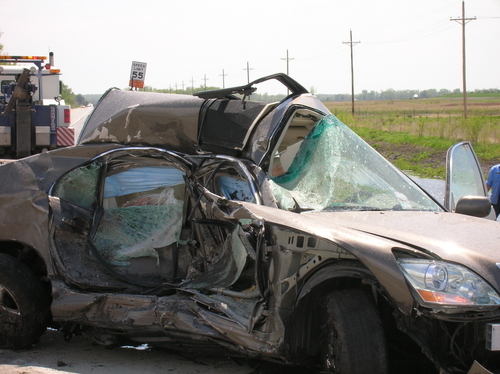 Larger modes of transportation, such as trains or buses, do not provide seatbelts for passengers, but in smaller vehicles seat belts save lives. According to the Centers for Disease Control and Prevention (CDC), seat belts reduce serious crash-related injuries and deaths by about 50%. As a vehicle owner, it is your responsibility to provide working seat belts for all of your passengers and age appropriate seats (or car seats) for younger passengers. Forget about the occasional discomfort and hassle of a seatbelt; choose safety over comfort! Driving while distracted is one of the most prevalent issues on our roadways. Bus drivers to small vehicle drivers are guilty of talking or texting on cellphones while operating a vehicle. Not only does texting and driving-related accidents take lives each year, but texting while driving takes your eyes off of the road for about 4.6 seconds; if you are driving 55 mph, that’s like driving the full length of a football field while wearing a blindfold. Texting and driving is not the only deadly distraction. Any activity that requires a driver’s attention from the road can increase the chance of a vehicle crash. As a driver, your full attention needs to be on the activity of driving. As a passenger, you are technically a distraction. If you are traveling in a full car, make sure you stop to take breaks (rather than eating in the car), map out your trip beforehand, entertain the carload with quiet activities, and put distractions out of reach. It may not be the idyllic family “road trip” blasting Christmas carols and sipping hot cocoa, but it’s best to place it safe. There’s fun to be had at your destination! Angry and aggressive drivers clog up our roadways with their obscene gestures and their bullying behaviors, causing car accidents every day. Just because you don’t like the way another person drives, you shouldn’t take it out on them or other innocent motorists and passengers. Speeding and overall reckless driving can make any trip stressful for fellow motorists and the passengers stuck in the car with you. Make a resolution early this year and vow to change your driving behavior. Eliminate the “Road Scrooge” within you, let other drivers merge or pass you without them worrying about becoming your next target. Additionally, practice sharing the road and look out for other vehicles, big and small. With each holiday comes lots of celebrating. Whether you are having a glass of brandy by the fire on Christmas Eve or clinking glasses of champagne with friends on New Year’s Eve, you should never drive after you have had alcohol. Alcohol makes you feel great and maybe even level headed, but it has the ability to quickly impair judgment. Drunk driving is not a new issue, but despite the well documented dangers of death and injury, drunk driving accidents continue to occur each holiday season. If you are a driver, either vow to be a designated driver or make an alternate plan. If you are a passenger, don’t get in the car with a driver who has celebrated too much. Whether you are a driver or a passenger, if you notice dangerous behavior on the roads you can report it. If you are riding the bus and see the driver texting or if you notice a driver swerving in and out of lanes, report the incidents. You should not, however, try to interfere and “fix” the problem yourself. If you notice dangerous driving, try to keep a safe distance, pull over safely (when possible) and report the driving incident. This year, may your holiday travels be safe, quick, and drama-free. This holiday season, give the gift of being a safe driver or a quiet passenger and arrive alive at your destination.